Are you suffering from bad managers or poor management? And you thought your boss was unreasonable? Bet he never asked you to perform oral surgery or fill in for the bomb squad. Talk about "other duties as assigned!" 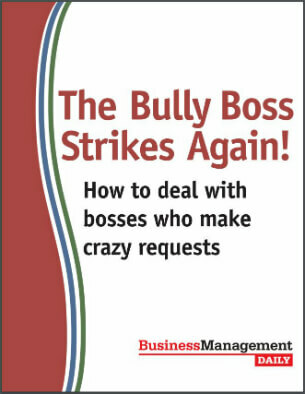 Along with dozens more outrageous tales we gathered, it includes practical advice on how to manage a toxic boss. Our readers have shared several stories about poor management. Unfortunately, bad managers at work are something that many administrative professionals have had to learn to work around. The editors of www.BusinessManagementDaily.com asked administrative assistants to weigh in with the craziest things their bosses had ever asked them to do. They expected to hear about killer hours, volatile tempers and perfectionist demands. They didn’t anticipate anything involving stool samples. Here are some of the best examples of "other duties as assigned." Inspect the boss’s sandwich every day to make sure it contained no tomatoes. Send fake rejection letters from universities to the boss’s daughter as a joke. Take a Johnny Mathis album cover to the tailor to find material that matched Johnny’s jacket. Throw a surprise party for an up-and-coming vice president’s dog. Look for “anything suspicious looking,” after someone had called in a bomb threat. Stuff tissue between the boss’s upper lip and teeth, after he chipped a tooth and then glued it back together. Spray the boss’s bald head with sunscreen. These outrageous stories came in response to a post on “Admin Pro Forum,” one of BusinessManagementDaily.com’s expert blogs. Don't let a bad manager get between you and your career. Be the best at something by developing a high degree of skill on a topic or picking up technical knowledge (such as software skills) that can help your company. News of your expertise will trickle up. Volunteer for a rush job or a project that’s running over deadline. Higher-ups will notice. Execs love employees who show their commitment to the team. Seek out praise for your group. When you say, “My team did a great job,” that’s showing leadership skill that people will remember. Nurture relationships with key clients. If you’re in a position to be indispensable to key clients, you’ll be able to build on your professional relationships with them. Become a mentor. You’re never too young to share your experience with junior members of your organization. Praise your boss—when it’s deserved—to your co-workers and other supervisors. Example: If your boss has been extra supportive of your career development, write her an email telling her that you appreciate it. Be sure to “cc” her boss. Gain a deep understanding of your boss’s goals, the department’s strategies and the company’s objectives. It will help you set priorities and make smart decisions about what work to tackle.